Richard Posner: How Many Constitutions Can Liberals Have? One is tempted to say that this is preposterous, and leave it at that. But it is an attempt to respond to the felt need of professors of constitutional law, and of judges who rule on constitutional cases (particularly Supreme Court justices), to find, or at least to assert, an objective basis for constitutional decisions. On the eve of the Supreme Court’s decision on the constitutionality of the Affordable Care Act—a time of liberal panic—Amar was quoted as saying that if the Court invalidated the act “then yes, it’s disheartening to me, because my life was a fraud. Here I was, in my silly little office, thinking law mattered, and it really didn’t. What mattered was politics, money, party, and party loyalty.” But the constitutional “law” that matters to Amar is not what other lawyers understand law to be. It is a palimpsest of twelve constitutions, only one of which is real. Amar is an entertaining writer and an imaginative reader of documents and history—too imaginative. He lacks practical experience and an empirical sense. He says, for example, that the rule of “one person, one vote”—that is, requiring that electoral districts have equal population, a judicial interpretation of the Constitution that dates only from the 1960s—”forms the bedrock of the American system of government.” Political scientists continue to debate the effects of the rule. There is no evidence that the effects have been great, or even good. And how can the “bedrock” of a system created in 1787 have been formed almost two hundred years later? 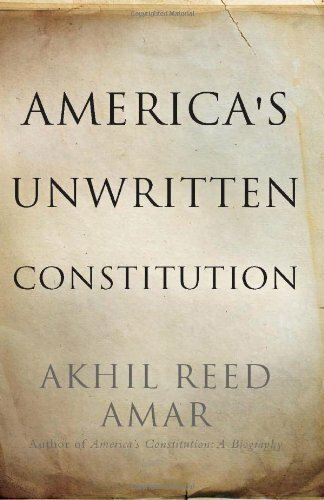 Amar knows a lot about the Constitution, and much of his very long book could be re-worked into a serviceable primer on constitutional law. But in its present form it is not a work of legal analysis. It is the effusion of a visionary and a utopian—of an idolater of the Constitution. Read the full article at The New Republic.